Come to Worlds of Fun from 4-7PM on Friday, April 26 for a Hire & Ride hiring event. We are looking for Ride Attendants and Lifeguards to keep the fun going, with positions paying up to $10 an hour. Come interview during the fair, and after enjoy select attractions in the park for a taste of the thrills in store! Working at Worlds of Fun is unlike any other job! Find fun, flexible scheduling, free park access, friends, and more. Perks today, Possibilities tomorrow! Click below to explore available positions in a range of options, there's sure to be something that fits for you! As KC’s largest employer of FUN, we have what you are looking for. With over 3,000 employees, our team comes with a variety of interests, come from a variety of backgrounds and come with one thing on their mind, have FUN and get PAID for it! Positions Include: Ride Operators, Sous-chefs, Cooks, Bartenders, Cashiers, Grounds Keepers, Guest Services Members, Merchandise & Games Employees, Landscapers, Security Rangers, Lifeguards, Costume Characters Entertainers, Musicians, Desk Clerks, EMTs, Paramedics, Accounting Assistants, Tellers, Office Clerks, Interns. We are really like our own city! Work with the A Team: Those that love to work hard and play hard. By play hard, we mean Ride and Slide for FREE at all the Cedar Fair Parks! Check please. Compare our pay. The HR team monitors the market to give us the competitive edge. Work when you want. Want extra $hifts? We got that too. Free tickets to the park! Your family and friends are going to LOVE you. Discounts on tickets, merchandise and food. Little known fact: Our employees dine on food created by a real life Executive Chef. FREE uniforms! If you don’t look good, we don’t look good. Employee only events. No one parties like we do. Advancement opportunities. We know how to move you ahead. You can meet over a million people or work behind the scenes with friends! Our Executive Chef comes from fine dining. He has managed some of the top restaurants in 22 different states. Our Food and Beverage Director has personally cooked for two different US Presidents. Our Operations Team is made up of life guards and ride operators, and live entertainment performers. Our park rangers are commissioned by the Kansas City Board of Commissioners. Our lifeguards are certified by the top water safety board in the country, Jeff Ellis and Associates, Inc. Many of our Emergency Services Team also work for the major emergency agencies in the area. Our General Manager started as a train conductor. So many different stories, so much talent and so much fun! 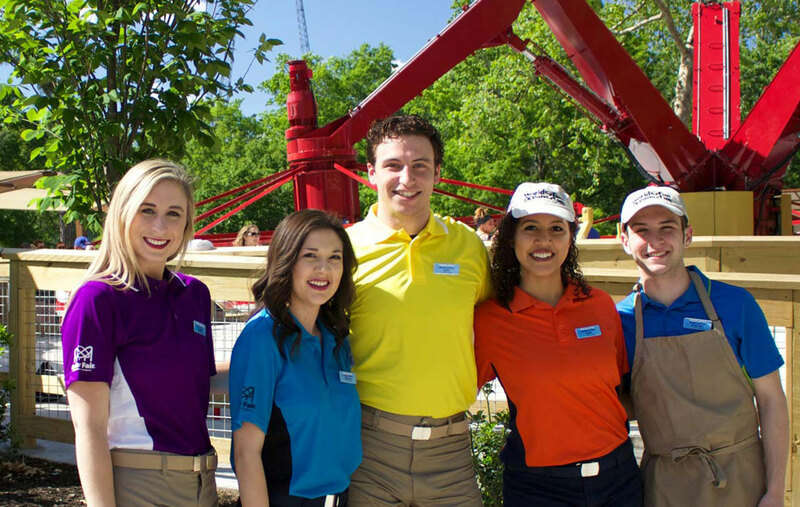 At Worlds of Fun, our associates are our greatest asset. As a top employer in the area, we strive to stay current with changing standards of appearance while emphasizing a professional and appropriate look for our team. Some examples of recent changes we have made in our appearance guidelines pertain to hair coloring, tattoos and piercings; Be you and delight our guests!